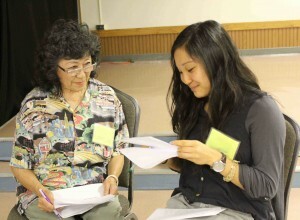 The Japanese American Citizens League-Pacific Southwest District (JACL-PSW) announces the second year of the intergenerational oral history program Katarou Histories. Isabelle Miyata and Kylie Rosero-Ozawa share stories as part of the Katarou Histories Program. Sponsored by the UCLA Aratani CARE grant, South Bay JACL Chapter, Greater LA Singles JACL Chapter, and San Fernando Valley JACL Chapter, Katarou Histories is a summer program designed to engage Nikkei high school youth, college students, and adults in the preservation of Japanese American history in the Greater Los Angeles region through the sharing of personal, family, and regional stories. “Katarou, meaning ‘let’s share stories’ in Japanese, is the primary goal of this program,” said a JACL-PSW spokesperson. “In retelling the story of Japanese Americans to our intergenerational community, this program fosters dialogue, teaches the value of history, encourages collaboration, and consequently helps to build a stronger community for the future. This summer, participants will gather for 10 weekly sessions in which they will collaboratively learn about identity, community, and history through workshops and discussions. They will also gain oral-history skills and other relevant historical preservation skills. Together, participants produce a “final project,” addressing historical preservation through stories. In the long term, this program creates a sustainable community by nurturing the youth to take a proactive role in preserving the legacy of the Japanese Americans. This year’s program will be run simultaneously in two locations from June to August. In the South Bay region, Katarou Histories will operate out of the Gardena Valley Japanese Cultural Institute on Tuesday evenings. In San Fernando Valley, there will be a parallel program at the San Fernando Valley Japanese American Community Center on Thursday evenings. For exact dates and times, visit the website. Any adults and seniors interested in connecting with youth, discovering hidden histories, and telling their stories are invited and encouraged to participate. Registration is $50 per participant for all 10 sessions and covers all food, materials, and workshops. Registration information can be found online at www.jaclpsw.org or by calling (213) 626-4471.